Gray skies loomed over the Miami Palmetto’s entrance on Mar. 3, but that did not stop the Palmetto Class of 1967 from showing their pearly whites in bright smiles. In a spur-of-the-moment decision, the few alumni able to reconvene in Miami decided to plan a reunion, resulting in an inevitably nostalgic visit back to their alma mater. The Capstone program, headed by Capstone Advisor and AP European History teacher Daniel Corradino, hosted their impromptu reunion and led a guided tour for them throughout the school. Paula Ehrlich hopped from wall to wall during their tour, taking pictures on her phone of every mural, poster and, yes, t-shirt she came across with an excited gleam in her eyes. Ehrlich is the president and founder of A Privileged Lifestyle, Inc. dedicated to providing people with financial independence and anti-aging products. She especially marveled at the new FIA program for forensic sciences, noting the stark contrast with the Home Economics classes she and her female peers had to take back in the 60s. Walking through the doors of the auditorium, a flood of memories overcame her as she recalled her group of closest girl friends, nicknamed the Palmetto Goddesses, who grew up together from first to twelfth grade. The media center – what was then a place solely for studying and checking out books – came as an even bigger shock to the group. No computers lined the wooden tables while they were students, and in addition to the iPrep program that now boasts computer technology as an educational resource, some of them jokingly wished they could do it all again. They especially enjoyed seeing their old principal, Robert Moloney, within the borders of a dusty frame mounted high on the back wall of the media center. As they pointed index fingers toward the wall of principals, discussing which ones presided over Palmetto during their years there, the time that has passed since then finally hit them. The Class of ‘67 reconvened for a cocktail party that night and enjoyed the short time together catching up on years’ worth of stories. 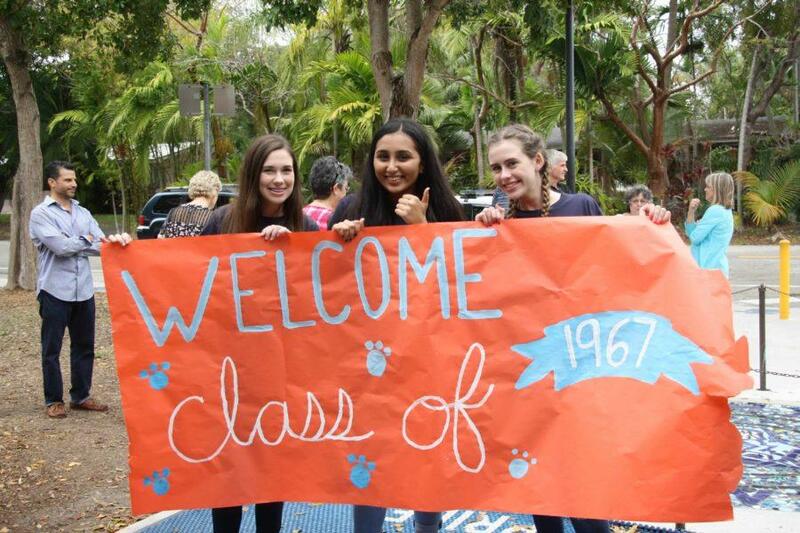 The past met the present that afternoon, with some of Palmetto’s first students smiling face-to-face with Palmetto’s current students, who welcomed them with bright banners and a personal rock concert to kick off the tour. It is now a younger generation who they hope will continue the Panther spirit.